Humans have been interacting with dolphins for as long as we have known of their existence. Analysis of dolphins has helped us to study and research our origins in the animal kingdom. There are several similarities between dolphins and humans that are not even found between humans and apes. There are many things to suggest that the dolphin is related to land mammals. The fact that they need to get air from the surface of the water is the most obvious sign. In the beginning, human interaction was mainly limited to hunting dolphins, but luckily as we learned of their intelligence and capacity for relationships things began to change. There are now many positive stories of the good relationships between dolphins and humans, including the way this almost totally non-aggressive creature not only likes interacting with humans but sometimes saves them. An excellent example is the work of the US Navy and how they use intelligent trained dolphins to work as part of their naval fleet on activities such as finding land-mines. Dolphin Assisted Therapy is another good example. Originating in 1978 by Dr. David Nathanson, Dolphin Assisted Therapy (DAT) has been used as a therapeutic approach to increase speech and motor skills in patients who have been diagnosed with developmental, physical, and/or emotional disabilities, such as mental retardation, Downs syndrome, and autism. It is suggested that the unconditional love and support a dolphin offers can benefit children and also mentally ill patients by helping them learn to develop trust. Many believe that dolphins have human-like emotions and the compassion that they’re able to give increases self-confidence, social skills and academic achievement in children and others who may be lacking these skills. Since its’ introduction, Dolphin Assisted Therapy has become a very controversial topic in the medical world. 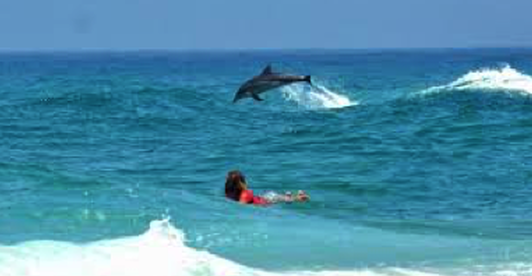 Theories such as the one by Nathanson suggest that Dolphin Assisted Therapy is simply a program that works to modify behavior by rewarding the patient with dolphin swims for performing a desired function. Scientists, however, are considering the possibility that the sonar of the dolphins can actually trigger the healing process by increasing T-cells and endorphins. DAT has been suggested for use in healing and pain relief as well as increasing attention span, enhancing learning, and increasing motor skills and coordination in children. While dolphin therapy seems to work best with children, it’s also a popular therapy for handicapped adults. No one knows why, but dolphins have been saving people for thousands of years. Dating all the way back to Ancient Greece, there are dozens of claims of dolphins rescuing people from sharks, helping drowning sailors, and guiding boats through rough waters. But it’s not just ancient mythology – it’s still happening all the time. Although wild dolphins face many natural dangers within the deep expanse of the ocean, man is their biggest threat. As Swim With The Dolphin (SWTD) programs and Dolphin Assisted Therapy (DAT) continue to gain popularity, we’re seeing more and more dolphins being held in captivity than ever before. While some scientists claim that dolphin research is progressing in great strides, critics believe that holding wild dolphins captive is cruel and should be stopped, and there are numerous private and public organizations that work tirelessly for the conservation of all species of dolphins. Worse than the issue of keeping wild dolphins imprisoned in captivity for the frivolous pleasure of a paying public who wish to swim with them and touch them, are the real atrocities against wild dolphins which happen world-wide like the cruel slaughter of thousand of dolphins in Japan, Solomon Island, Peru and many other places ! Overfishing , enviromental issues and slaughtering will lead to a fake dolphin… much like a fake world!